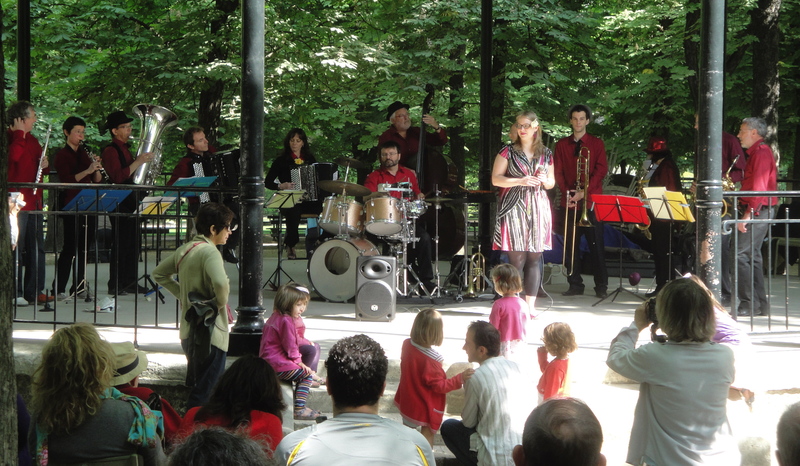 Some time ago I wrote about Richard’s and my chance encounter with an unusual musical ensemble during a visit to the Luxembourg Gardens in Paris on a fine Sunday morning. A fellow citizen of the internet, artisanuk, happened to be at the Luxembourg Gardens to hear the ensemble that morning. artisanuk later found my blog posting on the performance and asked whether I knew the name of the group. Alas, I did not. Now artisanuk, whose internet sleuthing ability obviously far exceeds mine, has discovered that the name of the group is FAZ and also has located their myspace page, which includes video clips and recordings of FAZ performances. To make it even better, one of the FAZ performances is of a song the group played when we saw them at Luxembourg Gardens. If you are interested in hearing music that is a little offbeat, I encourage you to follow the link above and give one of their songs a listen. Thanks, artisanuk! Courtesy of your hard work, I not only know the name of the ensemble, I also now know that what I was calling the Austin Powers theme song is really named Soul Bossa and was written by Quincy Jones. So, through the power of the internet, interested onlookers satisfy their curiosity and the music of an obscure ensemble may reach a slightly wider audience of people half a world away. That kind of collective linking is what the internet is all about. Richard’s recent post about his stay in Munich reminded me of my visit to that city, and to its legendary Hofbrauhaus, in the summer of 1980. I was traveling around Europe on a shoestring after my college graduation and, like Richard, was conserving money by staying in hostels and not eating out. However, I had heard about the Hofbrauhaus and decided I just had to drink a beer there. So I scrimped even more on the days leading up to the Munich leg of my journey to make that dream a reality (and a windfall due to a surprise invitation to stay, for free, at an Odense commune sure helped). After I arrived in Munich and found a hostel I went right to the Hofbrauhaus. It was mid-afternoon and the place already was jammed. Patrons sat at long common tables, and burly waitresses carrying fistfuls of beer steins and platters of food weaved through the mob. I found an open spot, ordered a huge tankard of beer, and was promptly engaged in conversation by young women also seated at the table. They said they were members of a local bowling team celebrating the end of their season. They were happy, loud and red-faced, inhaling snuff and guzzling beer, and eager to practice their English with an American. I don’t remember what we talked about — I doubt if they would, either — but they insisted I try some snuff, and after a few more gulps of beer I agreed. They demonstrated that you tapped out the snuff onto a spot on your hand at the base of your thumb and snorted it up. It was the only time I’ve ever tried snuff. It was disgusting, but I appreciated their company and their generosity. I felt welcome at that loud, bustling place, and the beer was good, too. 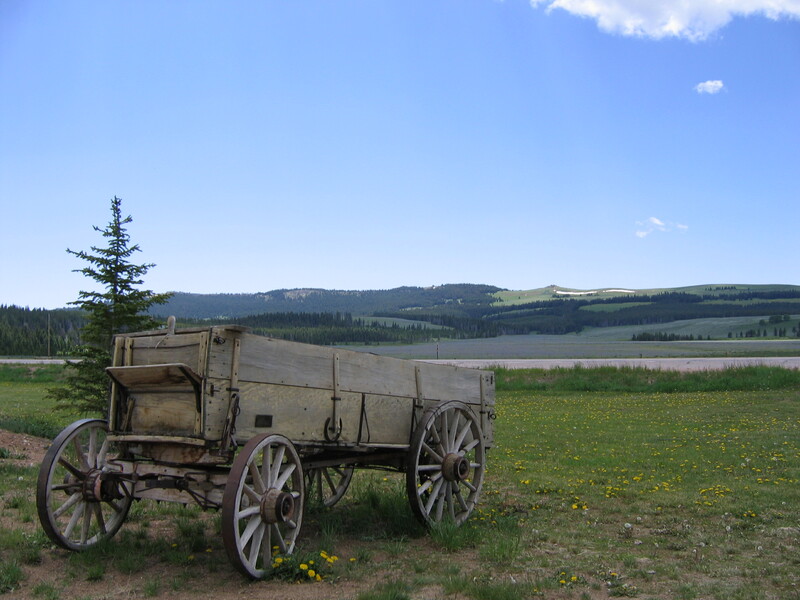 Could any single object be more evocative of the American story than a wind-beaten, weathered wooden wagon, such as may have been used to help take settlers into the great western wilderness? This version of the classic American icon was found several years ago outside Cody, Wyoming.